Why pumpkin seeds? Well, most notably, they’re incredibly nutritious and rich in protein. But also, when toasted just enough to bring out their flavor, they can also be tasty. My favorite way to enjoy toasted pumpkin seeds is over my recipe for sautéed kale with lemon juice, olive oil, and sea salt – which in turn, is the perfect complement to baked potato rounds dipped in vegan mayo for an easy vegan dinner. 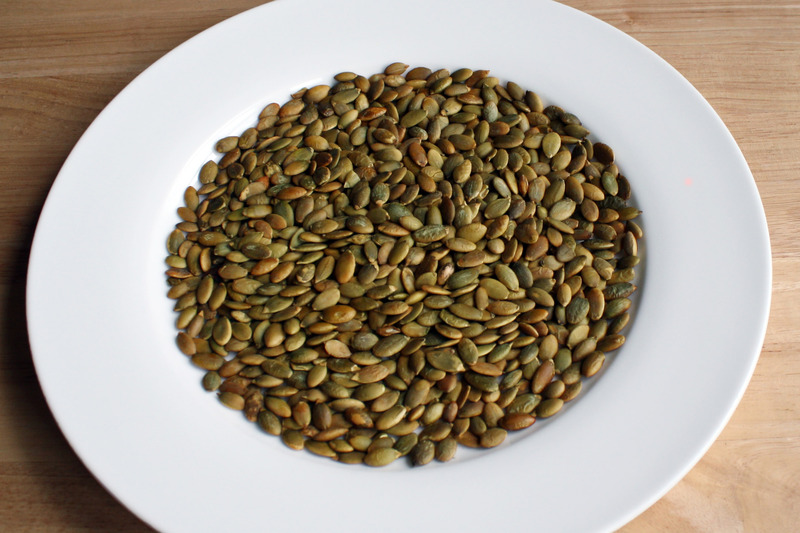 Sprinkled with sea salt or Herbamare, pumpkin seeds also make an excellent snack. Of all edible seeds, pumpkin seeds are the only ones that are alkalizing. Consuming alkalizing foods is important for maintaining a healthy pH level throughout one’s body. 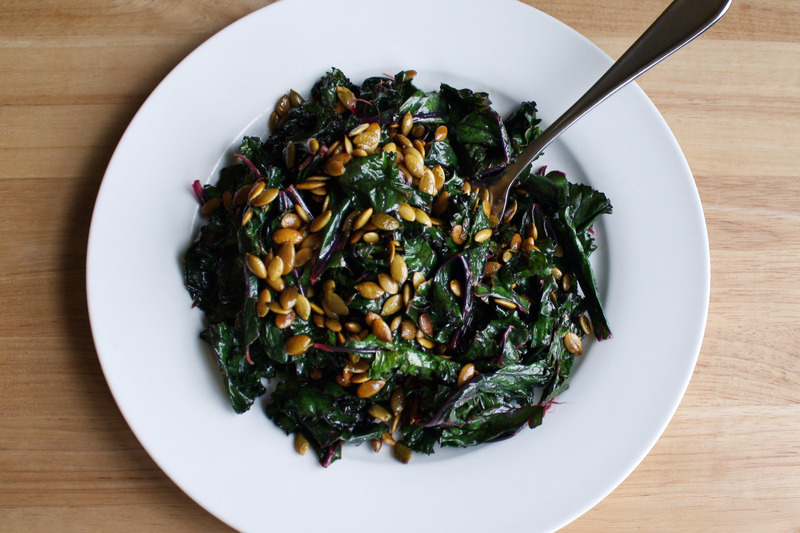 Enjoy these baked pumpkin seeds with my recipe for sautéed kale with lemon juice, olive oil, and sea salt! Sautéed kale cooked with extra virgin olive oil, lemon juice, and sea salt. Makes the perfect side or light dinner. Heat the 2 tbsp of extra virgin olive oil in a skillet over medium-high heat and add the kale. 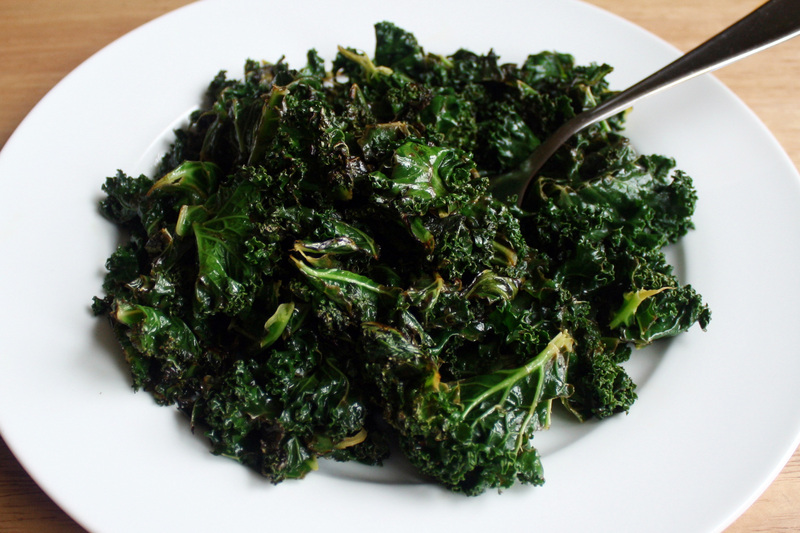 Flip the kale over with a spatula every 30 seconds, so that the sides are charred but not overly burned. Continue in this fashion for a few minutes, adding the lemon juice and pinches of Herbamare or sea salt and seasoning as you go. The precise point at which to stop cooking is a bit tricky – it should be cooked enough so that the sides are slightly crispy, and that it has a fragrant, enticing smell, but before the kale has given up all of it’s liquid and become completely wilted and withered. When you’ve determined that the kale is ready, immediately transfer the kale to a plate from the pan so that it doesn’t continue to cook while the pan is still piping hot.